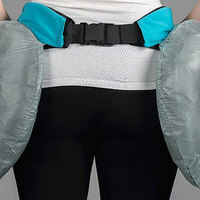 The wearable Hip'Air belt inflates automatically to protect seniors from falls. Designed to be comfortable to wear, the Hip'Air fits over the hips with the CO2 gas canister and electronics contained in the front. The device’s array of onboard sensors communicate with a specialized algorithm to detect a fall within 200 milliseconds, fully inflating the airbags located over the hips and thighs within 80 milliseconds.